A new poll reveals we’re sampling food, parking like maniacs and throwing basic courtesy out the window. We all have our shopping horror stories. As someone who strangely enjoys grocery shopping, I spend a lot of time at my local supermarket, and it seems every time I go I witness some pretty bad behavior from fellow shoppers. I’ve seen people grab from the salad bar — with their bare hands — and gobble up food without paying for it as if it were some kind of public sampling tray. I’ve seen people yelling at each other to move in the aisles, or not so subtly sighing and rolling their eyes at the slowpoke in front of them who is ogling the shelves and blocking traffic with their cart. I count myself among the slovenly offenders. I tend to be that slowpoke in the aisles, taking her sweet time as she reads the ingredients on the back of every salad dressing, her brimming cart drifting off into the way of others. A new poll by Treadmill Reviews considers some of the most offensive grocery store habits, drawing attention to just how bad it gets. Shoppers are not only taste-testing products (which 80 percent of people deemed inappropriate — and really it should be 100 percent), they’re parking like maniacs (nearly 50 percent of people say they’ve nearly been struck by a car in a supermarket lot), storming express lanes with carts that go way over the 10 item limit and leaving their emptied carts anywhere but back where they belong. What about the grocery store enables such brazen bad manners and entitled behavior? It may in part boil down to the basic, primal relationship between humans and food. That primal need gets triggered, which in itself can make us less mindful of our manners, and then you’re adding a hectic environment to the mix. Supermarkets are generally not calm, soothing places and they’re overflowing with products. So you’ve got a primal need activated and way too many options to meet that need. Some of us get to the grocery store without the worry of being in a hurry, and/or without having to stick to a budget. But this isn’t the case for most of us who are living paycheck to paycheck and desperately trying to coordinate work/life balance. 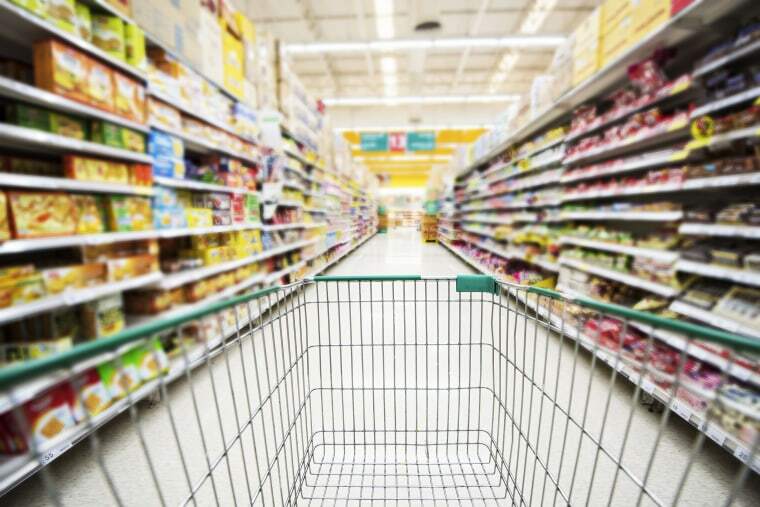 Dr. Sanam Hafeez, a licensed clinical psychologist and neuropsychologist, thinks that some of our anger and entitlement in supermarkets may be stemming from a deeper unease, particularly over the rising cost of living. Whether you’re the person carelessly leaving the container of milk in the toiletries aisle, or the person getting worked up by the recklessness of others in supermarkets, there are ways to deal and improve. Krimer has compiled a list of tips to help us be better, more considerate shoppers in the fluorescent chaos of the supermarket. “Build some awareness around how being in a store makes you feel and how it makes you behave. If you experience anticipatory anxiety or stress, or know that while you're there you often struggle with dealing with impatience (whether it's with your children or with other shoppers), this is your opportunity to bring your anxiety and stress levels down before you go." Alas, we can’t control the behavior of others, but we can control how we react to them, by taking a pause, considering that they may be having a bad day, and then letting our judgments go. We may also want to take some time in developing camaraderie with store employees. Say their names. Make eye contact. Ask how’s it going. Tip the person bagging your groceries if that’s appropriate — or at least say a meaningful thank you. Little acts of connectivity and gratitude can go a long way, and at the very least, they’ll probably help you feel less stressed out.